As China rebuts Hagel and Abe’s remarks, the region waits to see what might be on offer in return for cooperation. As The Diplomat noted late last week, the latest round of the Shangri-La Dialogue was held over the weekend. The most anticipated speeches were those of Japanese Prime Minister Shinzo Abe, U.S. Secretary of Defense Chuck Hagel, and deputy chief of the general staff of the People’s Liberation Army Lt. Gen. Wang Guanzhong. They certainly did not disappoint. Abe set the stage during the keynote speech on Friday, in which he laid out three principles for the “rule of law at sea.” Those principles, “making claims that are faithful in light of international law, not resorting to force or coercion, and resolving all disputes through peaceful means,” were directly targeted at recent Chinese actions in the South China Sea and East China Sea. Wang, who spoke last on Sunday (in full military dress), was emphatic in his defense of China. Referencing Chinese President Xi Jinping’s Asian security concept, he said “China is a constructive, proactive and positive force for Asia’s peace and security because China pursues the path of peaceful development,” according to Xinhua. 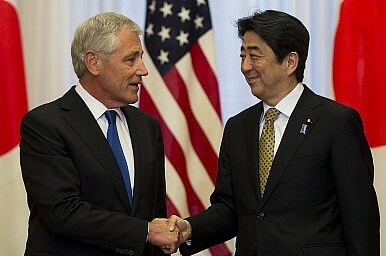 Wang described Abe and Hagel’s speeches as “provocative,” and said that the two were “coordinating” their attack. He also said that, while neither Hagel or Abe were correct in their assertions, he preferred Hagel’s candor at naming China directly, as opposed to Abe who simply couched his criticism in reference to the international rule of law. As to the question of how all of these comments were received by the other leaders at the conference, it is difficult to say at this point. The three most heavily involved parties have absorbed most of the media bandwidth in the immediate wake of the conference. Vietnam is a vocal exception. As one of the Southeast Asian states most deeply involved in conflict with China, Vietnam’s vice defense minister Nguyen Chi Vinh said (on the same day Wang made his remarks) that his country expects to receive coastguard ships from Japan next year. He also said Japan would help train and share information with its coastguard teams, and welcomed the support of the U.S. and Japan, while calling on other countries to be more vocal in their opposition to Chinese incursions in the South China Sea, according to Reuters. It will be interesting to note what other countries speak up in the wake of the conference, and what incentives for cooperation China, Japan, and the U.S. offer in return. Vietnam appears set to use international law to settle its territorial disputes with China in the South China Sea. Abe’s Attempt to Corner China Through DiplomacyWhat's in Japan's Record 2018 Defense Budget Request?Abe Heads to G-7 with South China Sea, Asian Security on his MindJapan White Paper Slams China Over Disputed TerritoryThe Shangri-La Dialogue: Troublemaker or Peacemaker? The US is still unrivaled in stealth technology. Will China ever be able to catch up?